The British armed forces have quietly turned to their traditional methods of finding “manpower” when they see themselves running short. While the “Leave” campaigners jump up and down about the threat of migrants from the EU and beyond, military strategists have other plans up their brass-buttoned sleeves. From 1998 to 2013 the armed forces were allowed to recruit heavily from Commonwealth countries until the government put a stop to it for various reasons. Now there has been barely any reaction to the recent news that they are once again offering jobs to non-UK citizens from Commonwealth countries due to ‘perilous shortages’ across the army, navy and RAF. Just one article in the Mail reported that Defence Minister Penny Mordaunt had waived the five-year residency requirements to allow 200 Commonwealth citizens a year to fill vacancies. According to the army website, there are currently jobs to be found, not as infantry soldiers but in a wide variety of supporting roles from chefs to marine engineers, “petroleum operators” to medical technicians. There’s no guarantee that those who have served the requisite five years will get UK citizenship, the costs of which have to be borne by the individual. This is worth restating as there are still many people out there who assume that military service performed by non-citizens somehow brings the automatic reward of naturalisation, which it has never done in the past. That is a longer story. Apart from the importance of keeping track of military recruitment policies, particularly when it comes to minorities, this latest development is significant for two other reasons. The first relates to the historical precedence of including and excluding postcolonial migrants in the UK armed forces, particularly in the post1960 era. An air-brushed version of this history is routinely summoned to justify whatever the latest policy might be: in her written statement announcing the latest news, for example, Mordaunt added that there had been a 'long tradition of soldiers from Commonwealth nations serving in the British military’. It is comments like this that compound the general ignorance about how Britain was able to maintain its military power for so long. Thanks partly to the funding of centennial heritage projects, younger generations now have more chances to learn about the ‘contribution’ of troops from all over the empire in WW1 and WW2. This is despite the fact that the information has been available for years through the patient work of historians such as Stephen Bourne, David Killingray, Marika Sherwood and others. But there is surprisingly little attention paid to the servicewomen and men recruited from former colonies in the second half of the 20th century whether through the mechanism of the Commonwealth or not. The artist Barbara Walker is a rare exception to this pattern of investigating the history of black soldiers from a safe historical distance. Her current exhibition of drawings, entitled ‘Shock and Awe’, makes direct connections between those who fought in regiments such as the British West Indies Regiment and the King’s African Rifles, and those black soldiers who have worked in the contemporary British Army. Her show, which can be seen at the MAC in Birmingham until 3rd July, is also unusual since it addresses the under-recognised role of servicewomen from the Caribbean and West India Regiments in World War II as well. The decision to recruit 200 per year allows the Ministry of Defence to maintain control over numbers of non-UK nationals in the sector. It echoes a similar policy carried out in the early 1960s, following the end of conscription, when the government allowed recruiting officers to bring 200 men and 12 women from Fiji into the army. Many were consequently deployed in the ‘secret war’ in Oman, often as members of the special forces. At the time it was noted that there were plenty more willing recruits where they came from, but as much as the particular qualities of Fijian soldiers were appreciated, there were no further attempts to bring them in. The descendants of some of those individuals, many of whom had distinguished careers in the army, were among those who joined in the late 1990s, as I discovered when I wrote Military Migrants. 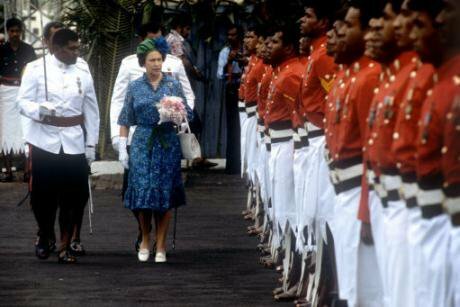 Queen Elizabeth II inspects the Guard of Honour of Royal Military Forces after coming ashore at Suva, Fiji, October,1982. Ron Bell / PA Archive/Press Association. All rights reserved.In 1998 the New Labour government waived the residency rules in 1998, hoping to increase the proportion of ethnic minorities as well as to deal with a shortage of “under-manning”. Over the next decade the recruitment of “foreign and Commonwealth” was so successful that senior officers began to express unease that the “Britishness” of the army was being called into question. Their request to limit the numbers of non-national recruits was initially prohibited by the Equality and Human Rights Commission, but in 2009 it was agreed that numbers in certain sections (ironically in the logistics trades and medical corps where there is now a shortage) could be capped at 15%. This is the second reason why it’s worth paying attention to this latest resort to military migrant labour. It concerns the question of what it means to attract young people to perform military work during this period of ongoing warfare. The British Army likes to think of its workforce as a pipeline with a tap that can regulate the flow of personnel passing through the organisation. The seemingly endless source of potential applicants from Britain’s former colonies means that they have backup when the local supply runs short. Today the decision to turn the tap on again – for a short while at least – is indicative of a crisis in recruiting at home, and this is the problem that is being masked by the re-introduction of migrants. In 2010 the coalition government announced that the army would not only be restructured, but also that numbers would be reduced from 102,000 to 82,000 by 2020. The plan was to increase the number of part-time employees, or reservists, to 30,000, a strategy that has dramatically backfired. The outsourcing of all recruitment procedures to Capita from March 2012 seems to have compounded the crisis. Recent statistics show that there has been a drop of 3,680 across the three services since April 2015. The navy has been particularly affected by its failure to attract young recruits, a problem that is largely attributed to the difficulties of going on Facebook under water. But the army is struggling as well. 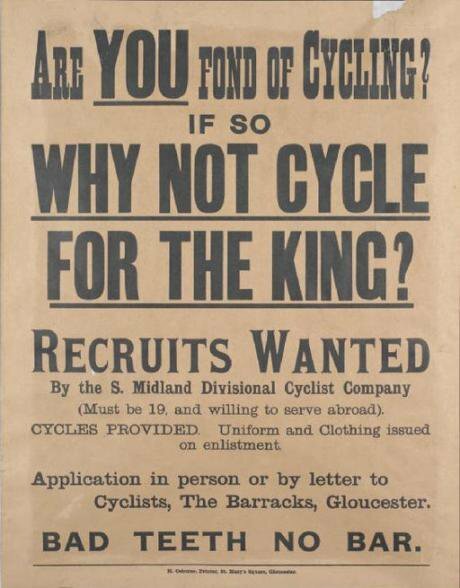 British Army recruiting poster for bicycle troops in World War 1. Wikicommons/ SOUTH MIDLAND DIVISIONAL CYCLIST COMPANY. Public domain. There’s nothing surprising about the fact that the army finds it difficult to attract a constant flow of young people eager to learn the ways of war-fighting. The difficulties arising from uneven rates of recruitment can be tracked throughout its history, especially since it became an all-volunteer force in the early 1960s and began competing with other kinds of employment. The recent advertising campaign with the slogan ‘Don’t Join the Army’ was a brazen attempt to challenge the negative reaction of parents and gatekeepers faced with female as well as male offspring expressing a desire to ‘be a better me’. A series of short videos uses reverse psychology to make joining the army look like a positive step away from a boring, predictable life. But the signs are that there is not the requisite number of teenagers wanting to be a “petroleum operator” or a military chef, even if it is only part-time. In April this year a new £1m recruitment campaign published research showing that young people spend an average of a full day each week on games or social networks such as Snapchat. Four-fifths of the 2000 people aged 18 to 35 who completed the survey admitted to wasting some or all of their spare time, although they also expressed the desire for more adventure and excitement. Army chiefs were reportedly perplexed at the results. Child Soldiers International (formerly CSUCS) is a UK-based ngo. Wikicommons. Some rights reserved. Perhaps the lack of enthusiasm displayed by young people for military work is one explanation for the government’s refusal to end the recruitment of 16-17 year olds. On May 23, the organization Child Soldiers International wrote an open letter to the Ministry of Defence, calling for an immediate end to the recruitment of under-18s and the raising of the recruitment age in line with the recommendations of the United Nations Committee on the Rights of the Child. The signatories included the Children’s Commissioners for Northern Ireland, Scotland and Wales and children’s rights alliances from across the UK. The letter pointed out that the UK is the only country in Europe to allow enlistment from age 16, and that most countries outside Europe now only allow adults from age 18 to join military forces, recognising that enlistment at younger ages is not appropriate in modern armed forces.